In Syria cartoon characters are appropriated and re-narrated in order to reflect anti-regime protest propaganda. 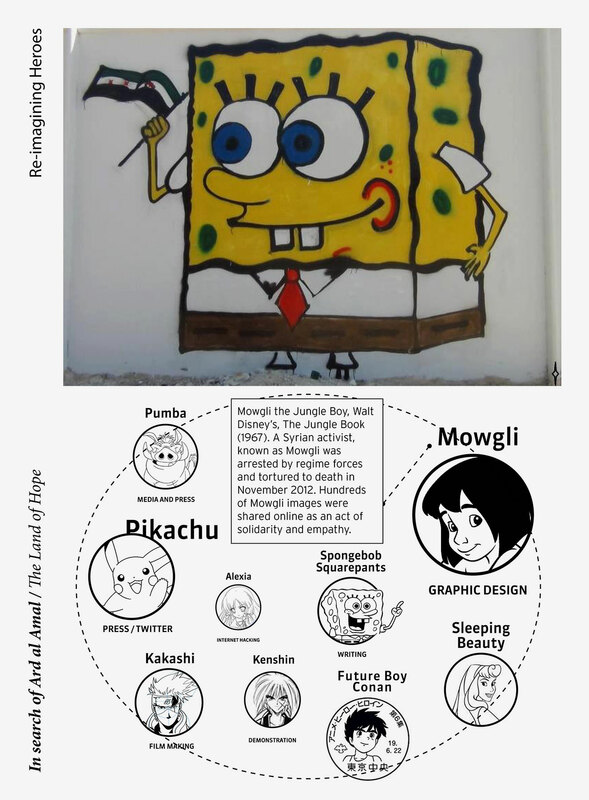 In 2012, in a small village in the North of Syria called Saraqeb, Mickey Mouse, Woody Woodpecker, and SpongeBob SquarePants all appeared as wall drawings in public spaces. Some of these wall drawings depicted Mickey Mouse holding a sign announcing: “Free Syria”. Photographs of these wall drawings are promoted on Facebook by the group responsible for the artworks. Well-known characters like Bert and Ernie from Sesame Street, Mowgli from Jungle Boy, Simba from the Lion King and SpongeBob SquarePants have all been used within the context of Syrian opposition propaganda. 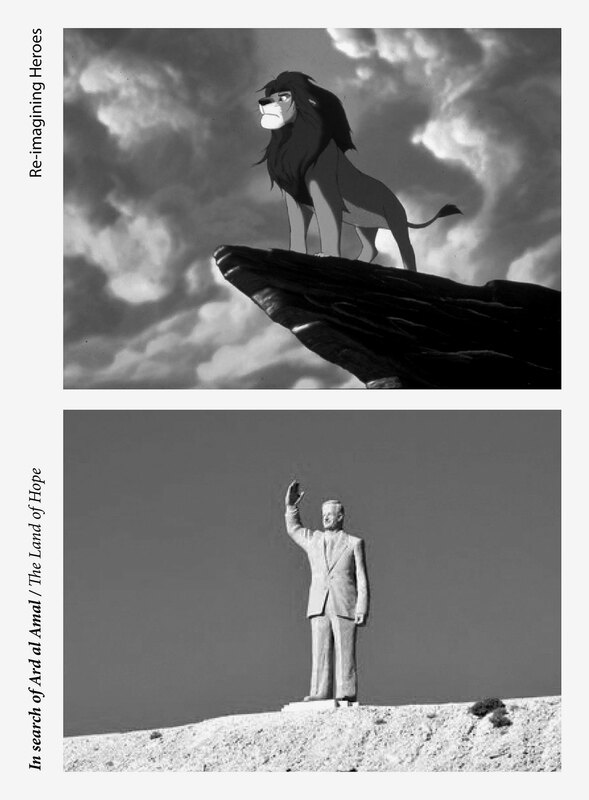 Characters are appropriated and re-narrated in order to reflect anti-regime protest propaganda. Strategies such as re-dubbing and re-scripting are used to ascribe new stories to known characters in order to bring across anti-regime protest messages. Characters are spread on social media where they display their protest messages through the use of familiar narratives, which reminds viewers of characters from their childhood. A pronounced lack of leadership within the Syrian opposition movement may be the reason why unlikely heroes have served as replacement representations for absent leaders or prominent inspirational real-life figures. Cartoon characters like the ones mentioned above – especially SpongeBob – are very popular in the Arab world, where they are not specifically perceived as originating in the West, since they are all dubbed into Arabic before they are broadcast. 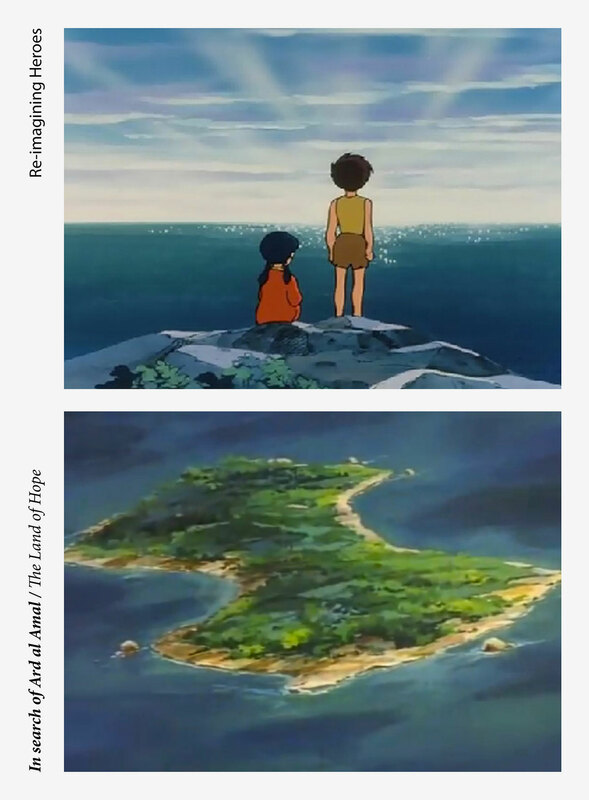 In 2012, we investigated a specific anime cartoon series called Future Boy Conan, or as it is known in the Middle East, Adnan and Leena, which was especially popular in Syria in the late-1980’s. The series was originally adapted from an American futuristic novel, animated in Japanese manga style, and thereafter dubbed into Arabic and disseminated throughout the Arab world. The post-apocalyptic story follows a boy and girl as they encounter great dangers during the course of their journey to find their destination, a paradise called, “Ard al Amal”, a fictional place that the characters never actually reach. Their journeys in seeking this paradise allow them to imagine a community beyond their existing reality, which is characterised by peace and order, unlike the daily nightmare they now find themselves in. Is it possible that cartoon characters and the landscapes they inhabit can provide us with clues that relate to future imagined society models? It is the 7th of May 2013, and we are located 40 kilometres outside of the centre of Cairo in one of the city’s so-called desert cities. We are at the headquarters of the SODIC (Six of October Development and Investment Co.), a property development company that is responsible for the mass development of luxury housing in the area. This particular desert city is called 6th of October City, in honour of the day in 1973 that the Egyptians retaliated against the Israelis. It is obviously a date very much associated with Egyptian nationalism. This desert city was originally developed in the early 1980s with plans to eventually house some 4 million people. What began in the 1960s as President Nasser’s social-democratic dream to de-centralise overpopulated Cairo by expanding out into the desert has slowly developed into a monolithic gated community for the middle class and the very wealthy. 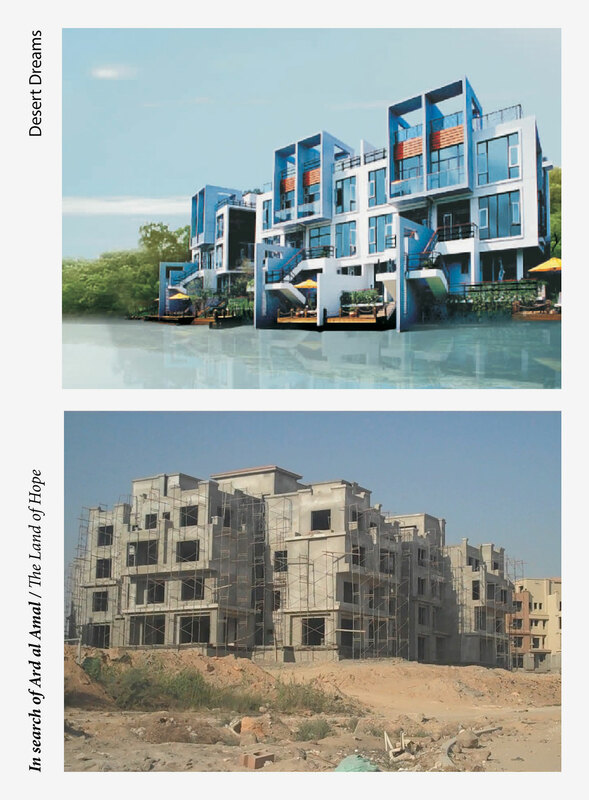 Developments called “Utopia”, “Dreamland”, “Beverly Hills” and “Swan Lake” have come to epitomise the desire of Cairo’s wealthy to escape the dusty and polluted city by moving to the desert, where luxury, air-conditioning and open space awaits them. The land for many of these developments was once Egyptian government or army land that was sold to developers relatively cheaply. Many of these sprawling developments, however, are still relatively empty. Many of 6th of October City’s residents are newcomers to Egypt including middle-class, Arabic-speaking refugees. Many Iraqi’s began arriving in the early 1990s, after the first Gulf War. A second wave of newcomers consisting of Syrians moved here after violence erupted in Syria in 2011. The new residents create their own communities here, establishing Syrian restaurants, hairdressers and bakeries. 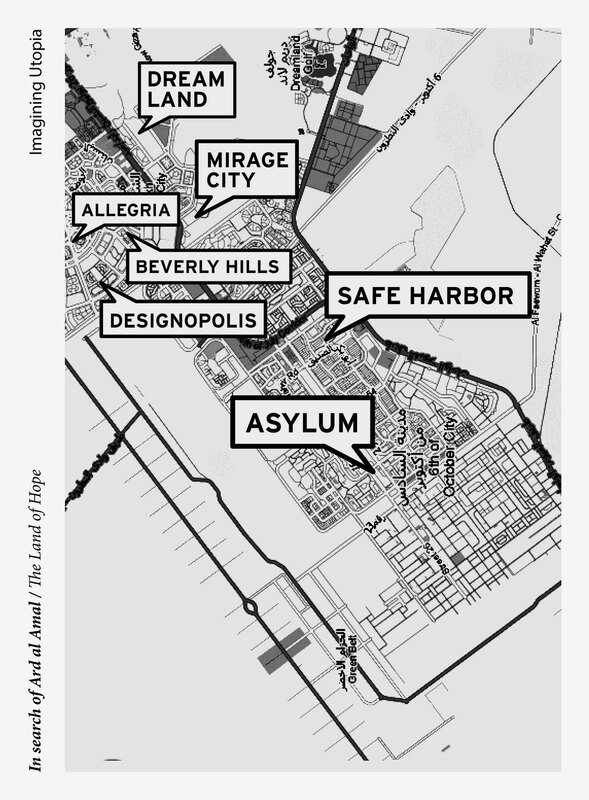 Middle-class refugee families are the perfect temporary renters for these under-populated housing developments owned by Cairo’s wealthy speculators. In the desert to the west of Cairo, the home buyers’dream to escape poverty and pollution converge with those of refugees, struggling to carve out a new life in their new homes in this mega-city. Since we arrived in Cairo in early 2013, we have been intrigued by the images created to promote 6th of October City. The images of idealised lifestyles, and dreamy visions of desert lifestyles commissioned by property developers can be seen on billboard after billboard alongside the highway as drivers head out of Cairo’s wealthier suburbs towards its barren outskirts. Drivers encounter these idealised images every few hundred metres. The aim of these images is to lure potential home buyers away from the political and social upheaval in central Cairo and toward an idealised landscape made real mainly through the use of Photoshop techniques that project beautiful watered and manicured lawns, swimming pools and air-conditioned convenience. The images of a futuristic luxurious city rising out of the desert sand project the hopes of 6th of October City, while also providing a safe haven for Syrian refugees, far from their war-torn homeland. The depiction of paradise through the use of images taken from Adnan and Leena’s “Ard al Amal” may not be the reality that Syrians discover in 6th of October City, however. 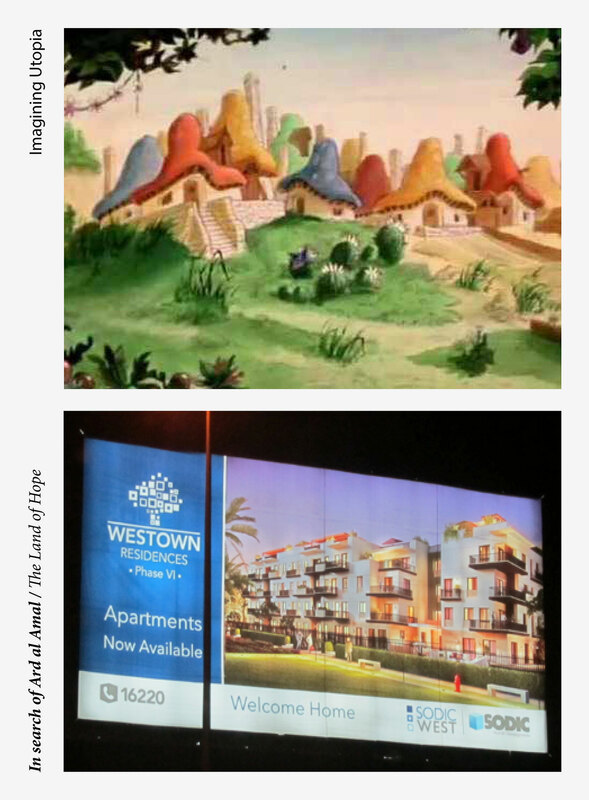 But it is interesting to notice how the billboard images of paradise and an unattainable fictional destination from a cartoon series strangely converge in the advertised depictions of paradise. 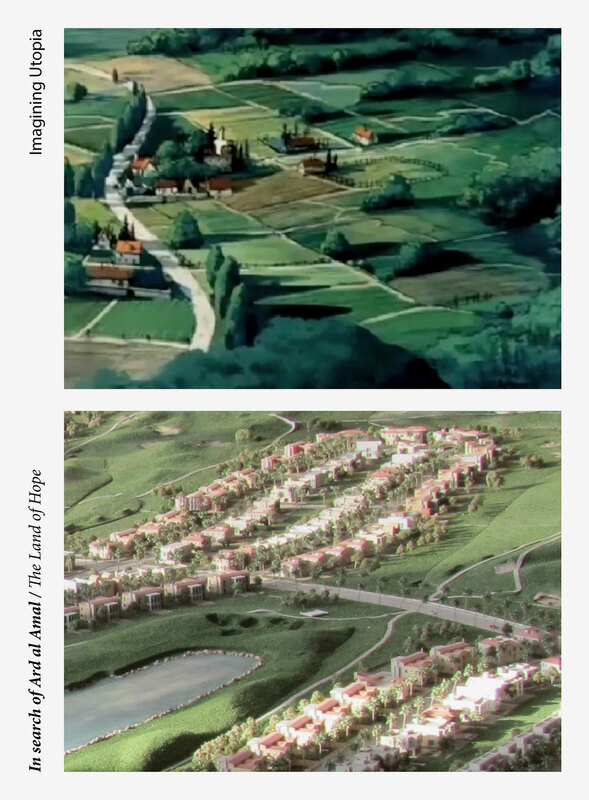 Without necessarily collapsing these two images and assuming that there are any direct similarities of intent or meaning between the two, it is interesting to speculate on their shared vision of utopia, which is mainly characterised by a landscape that depicts no people but plenty of greenery. 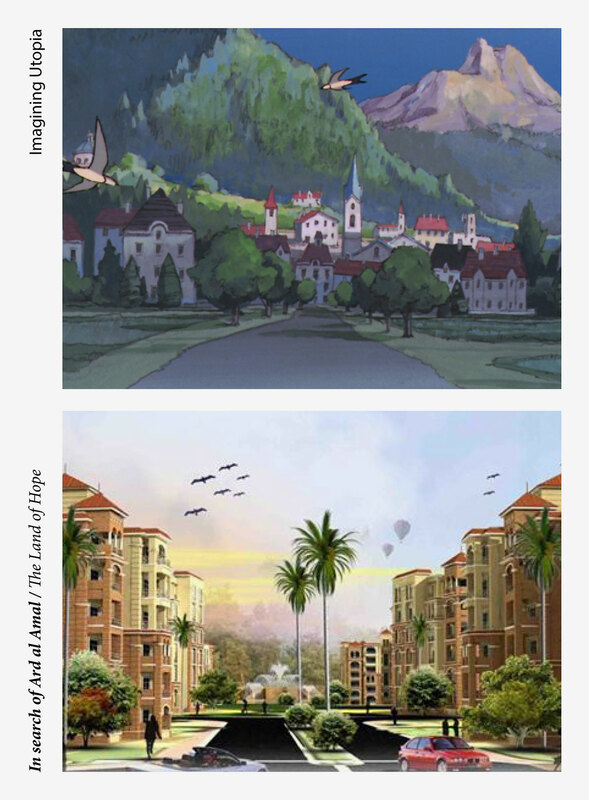 While Japanese animators created the image of “Ard al Amal”, advertising agencies hired by Cairo’s wealthy speculators conceived the images used for marketing the new suburbs. The architecture in both cases includes a depiction of paradise that projects a yearning nostalgia for European design and urban planning. They are images of a future life that may never actually exist. 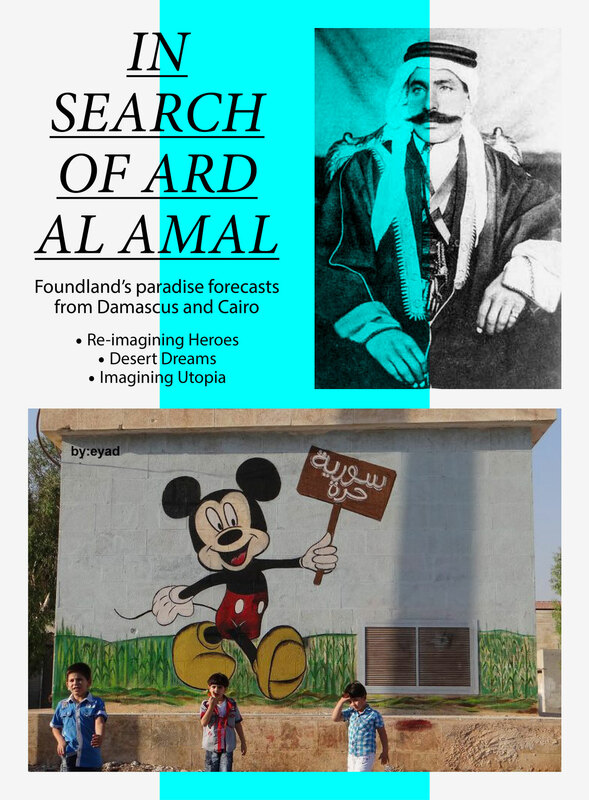 The “Ard al Amal” images, on the other hand, may represent an unattainable destination from a cartoon dream, but they also depict the struggles that Leena and Adnan must endure on their journey to paradise. However unattainable their paradise may be it can only ever be reached through struggle and navigation and can never simply be purchased. Above: A Portrait of Sultan Basha Alatrash. This image was used as a profile photo on Facebook by a Syrian opposition supporter. Sultan Alatrash symbolises anti-colonial rule in Syria and he has re-emerged as an anti-Assad figure. Below: Mickey Mouse wall murals by Syrian opposition villagers in Saraqeb, a village in the North of Syria. Translation: “Free Syria”. Above: Bob SquarePants holds a Syrian opposition flag. Below: A collection of characters used online to represent individuals active in Syrian opposition groups. Above: Mustafa on Pride Rock from Walt Disney’s, The Lion King (1994). Below: Statue of the previous President, Hafez al-Assad, along the road to Homs. 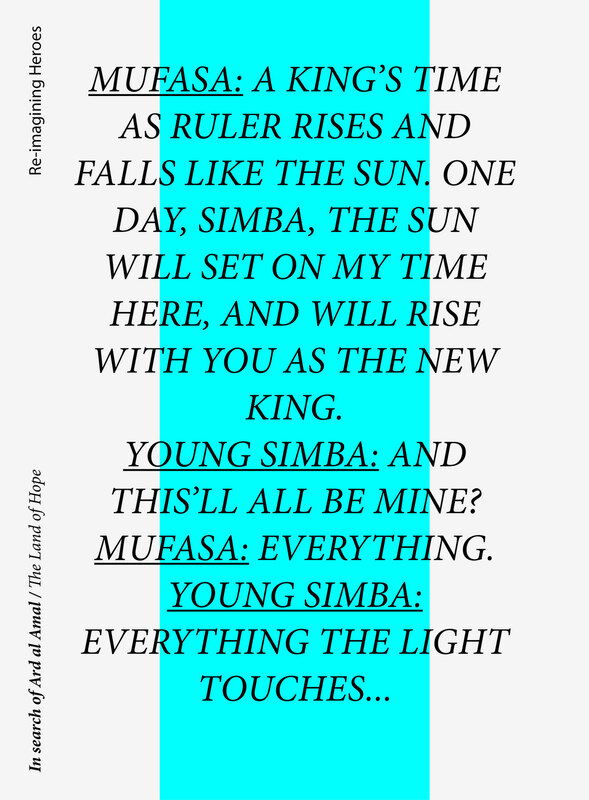 Dialogue between Mustafa and young Simba from Walt Disney’s The Lion King (1994). 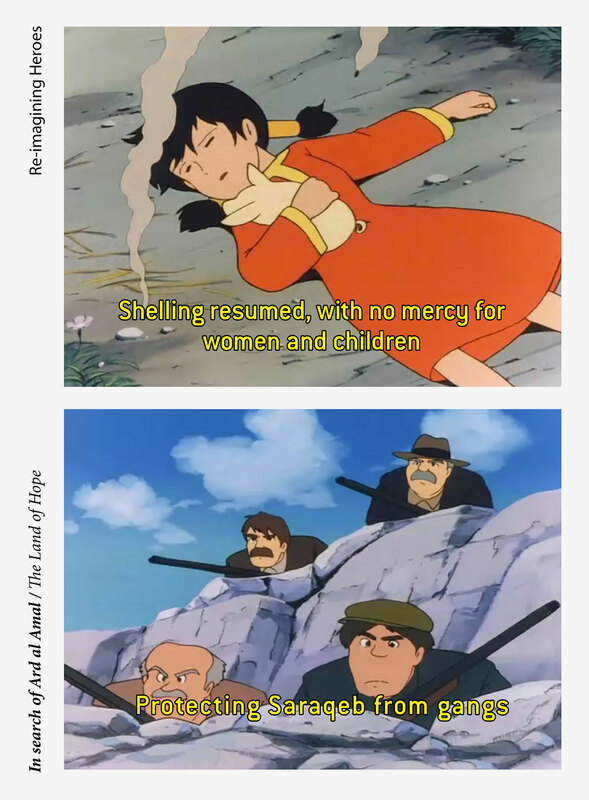 Stills from the anime cartoon series, Future Boy Conan or as it is known in the Middle East, Adnan and Leena. Produced by Nippon Animation in 1978, dubbed into Arabic and broadcast in the Arab World in the early 1980s. From Adnan and Leena, the depiction of “Ard al Amal”, which is their destination, an imagined paradise. Adnan and Leena attempt to find “Ard al Amal” after their home was destroyed in an apocalyptic attack. 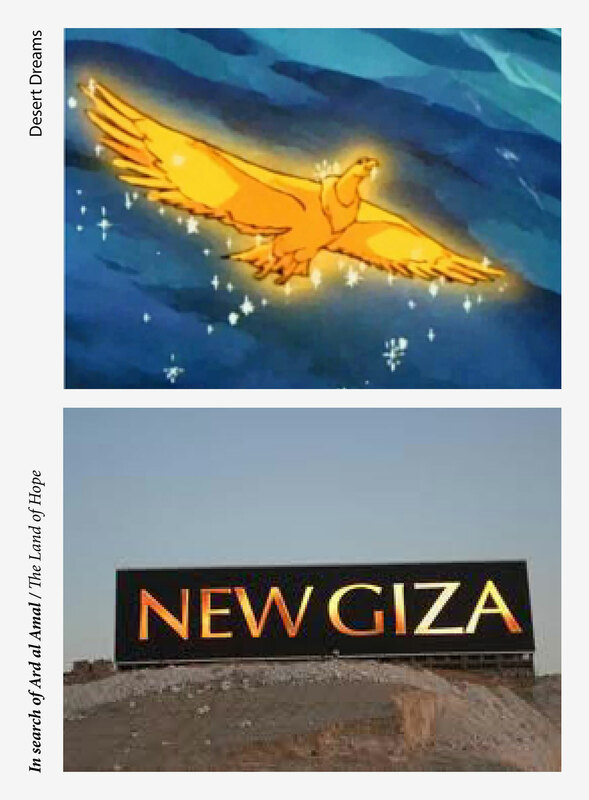 Above: The Golden Eagle from the Japanese anime series, Eldorado, Mysterious Cities of Gold, which the character Pepero attempts to follow with the hope of reaching the city of gold. Below: Billboard advertising New Giza, an emerging development consisting of luxury compound developments to the west of Cairo. Above: President Gamal Abdel Nasser is shown peeking into a new refrigerator. Nasser is well known for encouraging the production of cheap, quality consumer products inside Egypt during the 1960s. Below: Points extracted from The National Charter, which precipitated the 1952 Egyptian revolution. These points were submitted by Nasser in 1962 to the National Congress of the short-lived United Arab Republic. 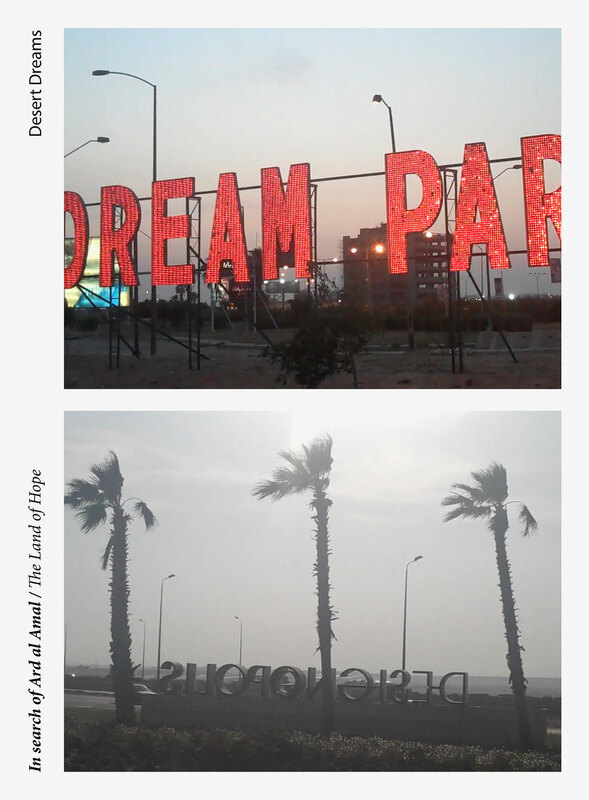 Above: Dream Park theme park and housing development signage, 6th October City, West Cairo. Below: Designopolis, design and housing centre, 6th October City, West Cairo. Above: Artists’ impressions of future developments by Six of October Development and Investment Co. Below: SODIC in-progress in West Cairo. Above: Beverly Hills compound entrance, 6th of October City, West Cairo. 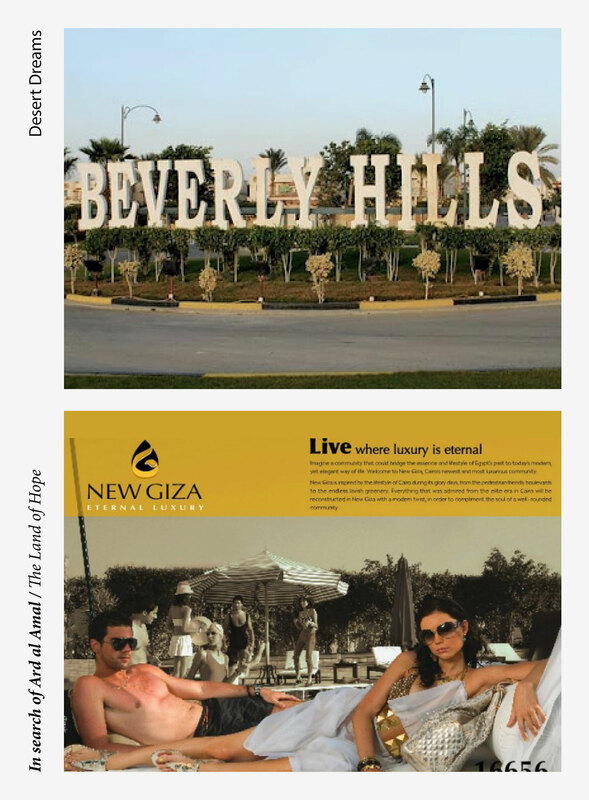 Below: “Live where luxury is eternal” advertising Campaign for New Giza, West Cairo. Above: Smurfville, the fictional home of the Smurfs from the Belgian comic and television cartoon, created by Belgian comics artist Peyo (Pierre Culliford) in 1958. Smurfville has often been compared to the communist model where each inhabitant makes an equal contribution to the community’s life and survival. Below: Billboard advertising for Westown, an upcoming luxury development as seen along the 26th of July Highway, heading west out of Cairo (May 2013). Above: Still image from Adnan and Leena of a flashback of their former lives and their ultimate destination, the paradise known as “Ard al Amal”. Below: Bird’s-eye view of SODIC West’s marketing model, seen at Designopolis, 6th October City, Cairo (May 2013). Above: A utopian view from Heidi, Girl of the Alps, a 1974 anime series by Zuiyo Enterprises, dubbed into Arabic and broadcast in Syria in the early 1980s. Below: A prospective view of a future SODIC housing development in West Cairo. An (inaccurate) map poking fun at the names of housing and shopping centre developments in 6th of October City. Names and marketing are often in English to appeal to an upper-class market. European and Mediterranean locations and names are alluded to as well as names that emphasise concepts such as safety and hygiene. Foundland Collective (Ghalia Elsrakbi, SYR and Lauren Alexander, ZAR) is a design, research and art practice, based between Cairo, Egypt and Amsterdam, the Netherlands. 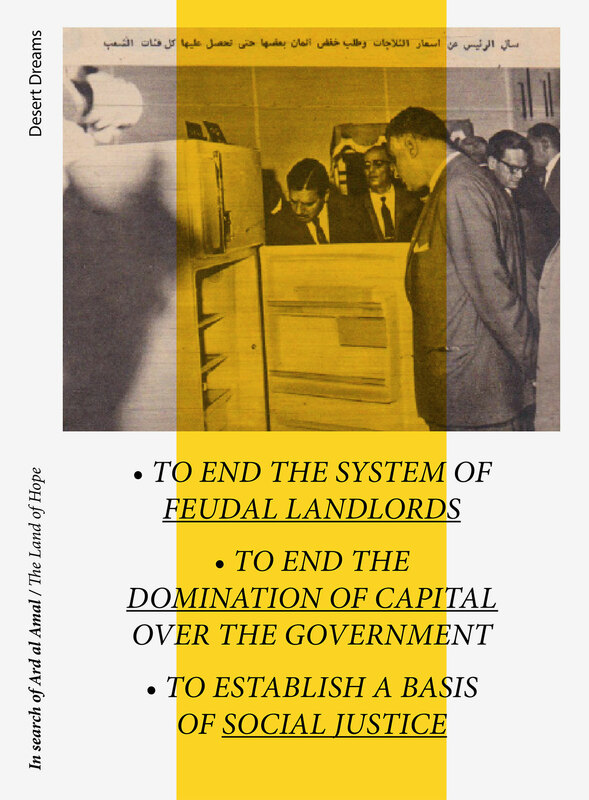 Since its inception in 2009, the collective have focused on critical analysis of topics related to political and place branding, manifesting their speculations and ideas through visual and written manifestations, exhibitions and publications. See further: www.foundland.info.